One of the pleasures of Toronto is discovering art happening in unexpected places. Scarborough is not the first part of Toronto one thinks of as presenting fully staged opera and yet that has been happening ever since 2014. This year the Cathedral Bluffs Symphony Orchestra and Tryptych Concert & opera present Engelbert Humperdinck’s charming 1893 opera Hansel and Gretel sung in English. The opera is well cast and staged. Only technical aspects of the presentation prevent the production from being the success it could be. Tryptych began its association with the CBSO, a semi-professional orchestra led by the dynamic Norman Reintamm, in 2014 when it presented a selection of excerpts from Mozart’s Don Giovanni. This was followed by each of three operas of Puccini Il Trittico – Il Tabarro in 2015, Gianni Schicchi in 2016 and Suor Angelica in early 2017. Last year in December it presented Menotti’s Amahl and the Night Visitors. 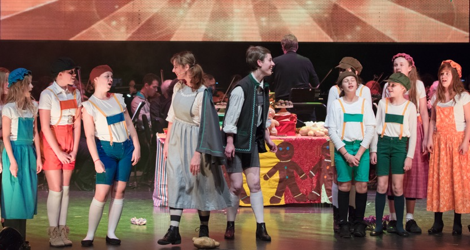 With Hansel and Gretel the CBSO has devoted an entire evening to opera for the first time. function as old-fashioned backdrops in 19th-century theatre except that an LED screen can be animated. The depth of the stage provides quite a large playing area in front of the orchestra. The only problem with the production is that the singers were miked. The reason for this are hard to understand. Unlike most opera singers, the singer here don’t have to sing over an orchestra in a pit put rather directly to the audience. And the P.C.Ho Theatre is supposed to have good acoustics and can adjust absorption and reflection of sound with curtains on the walls. Amplifying the singers causes several difficulties. First, of course, is that one doesn’t expect it or want it in opera. Amplification didn’t even used to be necessary in musicals. The main problem it causes at the P.C. Ho Theatre is an artificial difference in sound levels between the singers and the 61-member orchestra. The singers’ voices come out stereophonically through the speakers on either side of the proscenium which masks the sound from the orchestra behind it. In effect, it makes the fine playing of the CBSO sound monophonic in contrast. What is hardest to understand about this miking is that it does not appear to be necessary. From where I sat, which happened to be close to the stage, I could hear the singers’ real voices and all certainly sounded strong enough to fill the hall unaided. This notion was later demonstrated when the 15 members of the Toronto Beaches Children’s Chorus took the stage as the Witch’s gingerbread children. They were not amplified even though children’s singing voices are naturally weaker than adults’. They voices and their words cold be heard perfectly clearly on their own, more clearly, in fact, than those of some of the miked singers. Therefore, I really think the CBSO and Tryptych should rethink the use of amplification in presenting opera at the P.C. Ho Theatre. It’s a real pity to have the electronically enhanced sound of the singers destroy the nuanced sound that the orchestra is trying so hard to create. Despite this major difficulty, the opera is well presented. While an opera production isn’t meant to be a competition, it is quite clear that Meghan Symon as Hansel comes out on top in consistent beauty of singing, effective acting and stage presence. Symon has a warm, velvety mezzo-soprano and excellent diction and she acted “boyish” without recourse to any of the usual clichés of the part. Marion Samuel-Stevens displayed a bright soprano as Gretel with no sign of strain in reaching her high notes. She is not quite as comfortable on stage as Symon and her diction is not as clear, but the voices of the two blend beautifully in the Evening Prayer scene. As the children’s Mother Mila Ionkova has a powerful voice and stage presence. The anger Ionkova’s unleashes as the Mother is so forceful it is easy to see how the Witch later on can be perceived as her evil double. Yet, when alone, Ionkava reveals that her anger at the children is really part of the general strain of poverty and of feeling guilt at not being able to raise her children free of want. In contrast to the Mother is the children’s Father sung with a full, mature baritone by Douglas Tranquada, who fully conveys the happiness of someone who has finally experienced some good luck. Tranquada makes the Father’s narrative of the dangers of Ilsenstein, where the Witch lives, suitably ominous. Gretel’s parents rush off to find them. The result is that there is not a very long period of sleep between the departure of the Sandman and the arrival of the Dew Fairy. 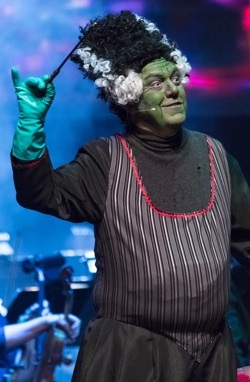 Tenor Lenard Whiting, following the lead of many famous tenors in playing the show’s panto-like villain, is a very breathy Witch who seems more delusional than actually evil. The members of Toronto Beaches Children’s Chorus are very impressive as the gingerbread children who plead to be awakened by a touch from Hansel and Gretel after the Witch’s demise. Any negative preconceptions one might have of a semi-professional orchestra one had immediately to set aside on hearing the CBSO. The ensemble produces a rich tone, perhaps a bit bass-heavy by being placed so far upstage, yet is still agile and precise in its playing with a fine unanimity in the strings when they have to bow their highest notes during the Evening Prayer. The wind section was also impressive with a delightful “cuckoo” coming from flutist Christine Fong. Of the two most atmospheric sequences one is choral when Hansel and Gretel call out and hear echoes of their call from the Children's’ Chorus offstage and the other orchestral when the children try to convince themselves that the Witch’s voice is nothing but the wind. Given that conductor Norman Reintamm has been programming difficult pieces for the CBSO from the 19th and early 20th centuries, including Dvořák, Rachmaninoff, Sibelius and Richard Strauss, Humperdinck’s opera fits right in the late romantic repertory for which both he and his orchestra obviously has such an affinity. 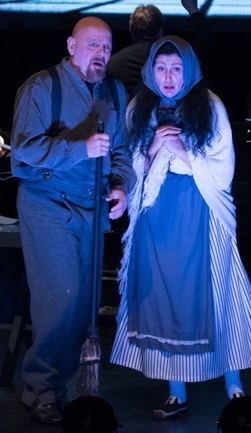 Hansel and Gretel marks the final opera that the co-artistic directors of Tryptych, Edward Franko and Lenard Whiting, will mount in Scarborough while they are still resident in Toronto. Luckily they plan to stage one opera per year with the CBSO even after they make their move to Kenora. If the CBSO and Tryptych can decide to do away with amplification, the balance between the singers and the orchestra will be restored and patrons of the CBSO will likely experience the even greater pleasure of the impact of the unaided human voices supported by a full orchestra in rousing human emotion. Photos: (from top) Marion Samuel-Steven as Gretel and Meghan Symon as Hansel with Gingerbread Children; Douglas Tranquada as Father and Mila Ionkova as Mother; Lenard Whiting as the Witch. ©2017 Huw Morgan.